Yerkes researcher Dr. Larry Young (front row, right) is one of several Emory faculty members participating in this summer’s Robert A. Paul Emory-Tibet Science Initiative (ETSI). 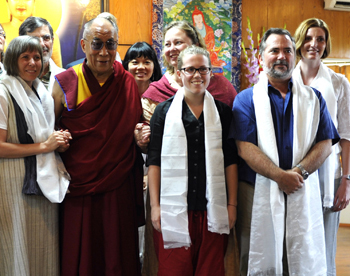 Dr. Young is spending two weeks in Dharamsala, India, teaching neuroscience to Tibetan monks. On June 6, Dr. Young and other members of the ETSI had a private audience with His Holiness, the Dalai Lama. Via the ETSI, His Holiness hopes to integrate a comprehensive science education into the curriculum of monasteries, which now includes only centuries-old Buddhist teaching. He believes bringing together modern science and time-tested Buddhist contemplative knowledge will facilitate the relief of suffering around the world. 2012 marks the first graduating class of monks from the program. His Holiness plans to send those monks to monasteries across India to teach science. Emory University takes great pride in being able to help fulfill one of His Holiness’ most cherished dreams of implementing comprehensive science education in the core Tibetan monastic curriculum.